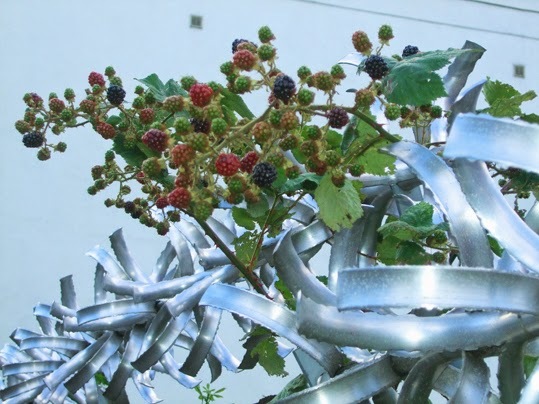 I love the correlation of this blackberry bush intertwining its thorny stems with the sharp metal atop this wall. In bygone times, brambles were sometimes planted to deter intruders or keep cattle in their place. Barbed wire took over from more natural means of enforcing boundaries since its invention in the 19th century. It was, of course, famously deployed at the edge of no-man's land in the First World War. Whether that razor-sharp steel in the photo is technically barbed wire or not is, I guess, debatable. It serves the same purpose. I pass the place in which I took that picture on my way home from the station, the last leg of my evening return from work. Now that tempting fruit is starting to ripen I've been reaching up to pluck ripe berries from the green shoots that are escaping their confinement - a sweet and refreshing taste of freedom.